Presents a color image as being composed of the Luminance of its pixels. Additional casting is performed according to the input and output image types following C++ default casting rules. The input color pixel type must provide a GetLuminance() method. Definition at line 69 of file itkRGBToLuminanceImageAdaptor.h. typedef of the functor that chooses the appropriate accessor Image or VectorImage. Definition at line 90 of file itkImageAdaptor.h. Accessor type that convert data between internal and external representations. Definition at line 86 of file itkImageAdaptor.h. Reimplemented from itk::ImageAdaptor< TImage, TAccessor >. Definition at line 82 of file itkRGBToLuminanceImageAdaptor.h. Definition at line 63 of file itkImageAdaptor.h. Direction typedef support. The Direction is a matix of direction cosines that specify the direction between samples. Reimplemented from itk::ImageBase< ::itk::GetImageDimension< TImage >::ImageDimension >. Definition at line 119 of file itkImageAdaptor.h. Index typedef support. An index is used to access pixel values. Definition at line 93 of file itkImageAdaptor.h. Definition at line 94 of file itkImageAdaptor.h. Definition at line 66 of file itkImageAdaptor.h. Definition at line 229 of file itkImageAdaptor.h. Pixel typedef support. Used to declare pixel type in filters or other operations. Definition at line 80 of file itkImageAdaptor.h. Reimplemented in itk::VectorImageToImageAdaptor< TPixelType, Dimension >. Definition at line 82 of file itkImageAdaptor.h. Definition at line 101 of file itkImageAdaptor.h. Definition at line 102 of file itkImageAdaptor.h. PixelContainer typedef support. Used to construct a container for the pixel data. Reimplemented in itk::RGBToVectorImageAdaptor< TImage >, itk::VectorImageToImageAdaptor< TPixelType, Dimension >, and itk::VectorToRGBImageAdaptor< TImage >. Definition at line 201 of file itkImageAdaptor.h. Definition at line 203 of file itkImageAdaptor.h. Definition at line 202 of file itkImageAdaptor.h. 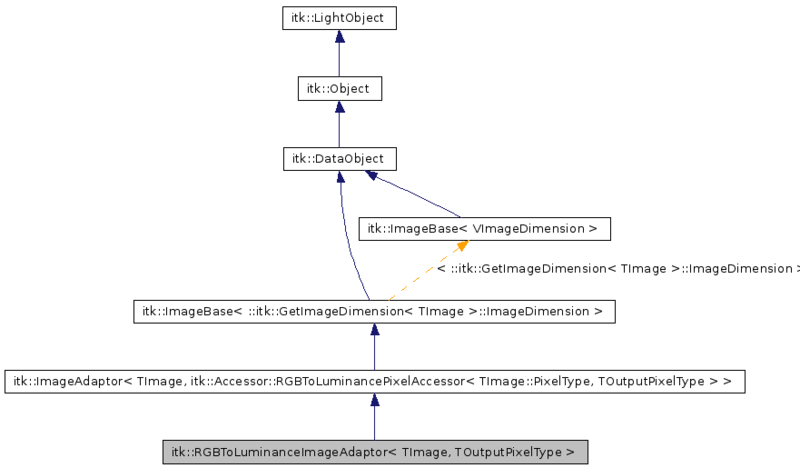 Reimplemented in itk::AddImageAdaptor< TImage >. Definition at line 72 of file itkImageAdaptor.h. Definition at line 81 of file itkRGBToLuminanceImageAdaptor.h. Origin typedef support. The origin is the geometric coordinates of the index (0,0). Definition at line 114 of file itkImageAdaptor.h. Region typedef support. A region is used to specify a subset of an image. Definition at line 106 of file itkImageAdaptor.h. Definition at line 77 of file itkRGBToLuminanceImageAdaptor.h. Size typedef support. A size is used to define region bounds. Definition at line 97 of file itkImageAdaptor.h. Definition at line 98 of file itkImageAdaptor.h. Spacing typedef support. Spacing holds the size of a pixel. The spacing is the geometric distance between image samples. Definition at line 110 of file itkImageAdaptor.h. Definition at line 80 of file itkRGBToLuminanceImageAdaptor.h. Definition at line 91 of file itkRGBToLuminanceImageAdaptor.h. Definition at line 92 of file itkRGBToLuminanceImageAdaptor.h. Allocate the image memory. Dimension and Size must be set a priori. Definition at line 171 of file itkImageAdaptor.h. Compute helper matrices used to transform Index coordinates to PhysicalPoint coordinates and back. This method is virtual and will be overloaded in derived classes in order to provide backward compatibility behavior in classes that did not used to take image orientation into account. Compute an offset from the beginning of the buffer for a pixel at the specified index. The index is not checked as to whether it is inside the current buffer, so the computed offset could conceivably be outside the buffer. If bounds checking is needed, one can call ImageRegion::IsInside(ind) on the BufferedRegion prior to calling ComputeOffset. Definition at line 285 of file itkImageBase.h. Calculate the offsets needed to move from one pixel to the next along a row, column, slice, volume, etc. These offsets are based on the size of the BufferedRegion. This should be called after the BufferedRegion is set. Copy information from the specified data set. This method is part of the pipeline execution model. By default, a ProcessObject will copy meta-data from the first input to all of its outputs. See ProcessObject::GenerateOutputInformation(). Each subclass of DataObject is responsible for being able to copy whatever meta-data it needs from from another DataObject. ImageBase has more meta-data than its DataObject. Thus, it must provide its own version of CopyInformation() in order to copy the LargestPossibleRegion from the input parameter. Inform the pipeline mechanism that data has been generated. This method is called by ProcessObject::UpdateOutputData() once the process object has finished generating its data. This essentially marks the DataObject as being updated and ready for use. Separate this data object from the pipeline. This routine disconnects a data object from the upstream pipeline. Hence an Update() from downstream will not propagate back past this data object. To completely isolate this data object from the pipeline, the application must remove this data object from any filters which it is connected as the input. Get the region object that defines the size and starting index of the region of the image currently loaded in memory. This method overloads the one in ImageBase in order to delegate to the adapted image. Return a pointer to the beginning of the buffer. This is used by the image iterator class. Definition at line 334 of file itkDataObject.h. Get the direction cosines of the image. The direction cosines are vectors that point from one pixel to the next. For ImageBase and Image, the default direction is identity. Image dimension. The dimension of an image is fixed at construction. Definition at line 143 of file itkImageBase.h. Get the region object that defines the size and starting index for the largest possible region this image could represent. This is used in determining how much memory would be needed to load an entire dataset. It is also used to determine boundary conditions. This method overloads the one in ImageBase in order to delegate to the adapted image. INTERNAL This method is used internally by filters to copy meta-data from the output to the input. Users should not have a need to use this method. Returns/Sets the number of components in the image. Note that for all images this is 1. Even for Image< RGBPixel< T >, 3 >. This is >= 1 only for time-series images such as itk::VectorImage. Get the origin of the image. The origin is the geometric coordinates of the index (0,0). The value returned is a pointer to a double array. For ImageBase and Image, the default origin is 0. Get the origin of the image. The origin is the geometric coordinates of the image origin. Definition at line 186 of file itkImageAdaptor.h. Definition at line 281 of file itkImageAdaptor.h. Definition at line 277 of file itkImageAdaptor.h. Definition at line 209 of file itkImageAdaptor.h. Return a pointer to the container. Definition at line 206 of file itkImageAdaptor.h. Get the region object that defines the size and starting index for the region of the image requested (i.e., the region of the image to be operated on by a filter). This method overloads the one in ImageBase in order to delegate to the adapted image. GetSource() returns a SmartPointerForwardReference and not a WeakPointer because it is assumed the code calling GetSource() wants to hold a long term reference to the source. Which of the source's outputs corresponds to this data object? Get the spacing (size of a pixel) `of the image. The spacing is the geometric distance between image samples. The value returned is a pointer to a double array. For ImageBase and Image, the default data spacing is unity. Get the spacing (size of a pixel) of the image. The spacing is the geometric distance between image samples. MTime for the last time this DataObject was generated. Definition at line 319 of file itkDataObject.h. Definition at line 317 of file itkDataObject.h. Graft the data and information from one image to another. This is a convenience method to setup a second image with all the meta information of another image and use the same pixel container. Note that this method is different than just using two SmartPointers to the same image since separate DataObjects are still maintained. This method is similar to ImageSource::GraftOutput(). The implementation in ImageBase simply calls CopyInformation() and copies the region ivars. The implementation here refers to the superclass' implementation and then copies over the pixel container. Restore the data object to its initial state. This means releasing memory. Dimension of the image. This constant is used by functions that are templated over image type (as opposed to being templated over pixel type and dimension) when they need compile time access to the dimension of the image. Access a pixel. This version can only be an rvalue. Definition at line 190 of file itkImageAdaptor.h. Setup a DataObject to receive new data. This method is called by the pipeline mechanism on each output of filter that needs to execute. The default implementation is to return a DataObject to its initial state. This may involve releasing previously allocated bulk data. Subclasses of DataObject may want to override this method and/or the Initialize() method if they want a different default behavior (for instance a DataObject might want finer control over its bulk data memory management). Definition at line 389 of file itkDataObject.h. Methods to update the pipeline. Called internally by the pipeline mechanism. Propagate a call to ResetPipeline(). Called only from ProcessObject. Release data back to system to conserve memory resource. Used during pipeline execution. Releasing this data does not make down-stream data invalid, so it does not modify the MTime of this data object. Set the region object that defines the size and starting index of the region of the image currently loaded in memory. Set the region object that defines the size and starting index of the region of the image currently load in memory. Set the direction cosines of the image. The direction cosines are vectors that point from one pixel to the next. The vectors whose direction cosines are stored in the Direction matrix, are expected to be orthogonal to each other, and they are expected to form a right handed coordinate system, but this is not checked nor enforced in the itk::ImageBase. Set the direction of the image. Turn on/off a flag to control whether every object releases its data after being used by a filter. Being a global flag, it controls the behavior of all DataObjects and ProcessObjects. Set the region object that defines the size and starting index for the largest possible region this image could represent. This is used in determining how much memory would be needed to load an entire dataset. It is also used to determine boundary conditions. Set the origin of the image. The origin is the geometric coordinates of the image origin. It is stored internally as double but may be set from float. Set the origin of the image. The maximum MTime of all upstream filters and data objects. This does not include the MTime of this data object. Definition at line 373 of file itkDataObject.h. Definition at line 182 of file itkImageAdaptor.h. Definition at line 285 of file itkImageAdaptor.h. Set the container to use. Note that this does not cause the DataObject to be modified. Turn on/off a flag to control whether this object's data is released after being used by a filter. Definition at line 304 of file itkDataObject.h. Set the region object that defines the size and starting index for the region of the image requested (i.e., the region of the image to be operated on by a filter). Setting the RequestedRegion does not cause the object to be modified. This method is called internally by the pipeline and therefore bypasses the modified time calculation. Set the requested region from this data object to match the requested region of the data object passed in as a parameter. This method implements the API from DataObject. The data object parameter must be castable to an ImageBase. Set the region object that defines the size and starting index for the region of the image requested. Set the RequestedRegion to the LargestPossibleRegion. This forces a filter to produce all of the output in one execution (i.e. not streaming) on the next call to Update(). Compute the index of the pixel at a specified offset from the beginning of the buffered region. Bounds checking is not performed. Thus, the computed index could be outside the BufferedRegion. To ensure a valid index, the parameter "offset" should be between 0 and the number of pixels in the BufferedRegion (the latter can be found using ImageRegion::GetNumberOfPixels()). Set the spacing (size of a pixel) of the image. The spacing is the geometric distance between image samples. It is stored internally as double, but may be set from float. These methods also pre-compute the Index to Physical point transforms of the image. Set the spacing (size of a pixel) of the image. Return flag indicating whether data should be released after use by a filter. Definition at line 424 of file itkImageBase.h. Definition at line 334 of file itkImageAdaptor.h. Definition at line 456 of file itkImageBase.h. Definition at line 349 of file itkImageAdaptor.h. Transform Take a vector or covariant vector that has been computed in the coordinate system parallel to the image grid and rotate it by the direction cosines in order to get it in terms of the coordinate system of the image acquisition device. This implementation in the OrientedImage multiply the array (vector or covariant vector) by the matrix of Direction Cosines. The arguments of the method are of type FixedArray to make possible to use this method with both Vector and CovariantVector. The Method is implemented differently in the itk::Image. Definition at line 491 of file itkImageBase.h. Definition at line 358 of file itkImageAdaptor.h. Get the continuous index from a physical point. Returns true if the resulting index is within the image, false otherwise. Definition at line 396 of file itkImageBase.h. Definition at line 307 of file itkImageAdaptor.h. Definition at line 370 of file itkImageBase.h. Definition at line 321 of file itkImageAdaptor.h. Verify that the RequestedRegion is within the LargestPossibleRegion. If the RequestedRegion is not within the LargestPossibleRegion, then the filter cannot possible satisfy the request. This method returns true if the request can be satisfied and returns fails if the request cannot. This method is used by PropagateRequestedRegion(). PropagateRequestedRegion() throws a InvalidRequestedRegionError exception is the requested region is not within the LargestPossibleRegion. Definition at line 621 of file itkImageBase.h. Definition at line 625 of file itkImageBase.h. Definition at line 620 of file itkImageBase.h. Definition at line 626 of file itkImageBase.h. Origin and spacing of physical coordinates. This variables are protected for efficiency. They are referenced frequently by inner loop calculations. Definition at line 619 of file itkImageBase.h.